"As we enter our centennial year we are still a young nation, very much in the formative stages. Our national condition is still flexible enough that we can make almost anything we wish of our nation. No other country is in a better position than Canada to go ahead with the evolution of a national purpose devoted to all that is good and noble and excellent in the human spirit." - Prime Minister Lester Pearson, 1967. Sir Charles Stanley Monck (Lord Monck, who became the first Governor-General of Canada from 1867-68), signs a proclamation on June 20, 1868, requesting Her Majesty's subjects to celebrate the anniversary of the formation of the union of the British North American provinces under the name of Canada on July 1st. May 15, 1879: Royal Assent was given to make July 1 a public holiday which would be named "Dominion Day." After this first anniversary, there are no records to indicate that ceremonies for the holiday were organized, not until the 50th anniversary of Confederation which fell on 1917. It took a proclamation from the Duke of Devonshire as the Governor General, on June 16, 1917, to set in motion the celebrations of the 50th anniversary of Confederation. A new Centre Block of the Parliament Buildings (under construction) was dedicated as a memorial to the Canadian military who fought with valor during the 1st World War. The Centre Block was also dedicated to the Fathers of Confederation. February 18, 1927: Royal Assent was given for the "Diamond Jubilee of Confederation Act & 1927 Incorporation of National Committee." From that, a grant of $250,000 and a 48-page colour pamphlet suggesting ways on how to celebrate a national thanksgiving, i.e. historical pageants, floats and tableaux were administered and distributed across the Dominion of Canada. A) The laying of the cornerstone by the Governor General of the Confederation Building on Wellington Street and the inauguration of the Carillon in the Peace Tower. B) In the afternoon, citizens heard speeches from Prime Minister William Lyon Mackenzie King; Governor General Willingdon; the official Opposition leader; and descendants of the fathers of confederations. The mix to this afternoon pomp and ceremony included public singing, a centenary choir and school children. C) A dinner was held at the Parliament buildings, organized by the National Committee and followed up that night with a historical parade. 1958: Dominion Day format includes "Trooping the Colours" during an afternoon ceremony on the front lawn of Parliament Hill. Evening festivities would include mass band concerts and fireworks display. July 1st, 1967: On this date (which happened to fall on a Saturday), Queen Elizabeth II pays tribute to Canada's Centennial in Ottawa (see excerpts below from that speech). The Queen would visit Expo 67 on Monday, July 3rd. "It is a hundred years of nationhood that we celebrate today. But let us not forget the earlier centuries of arduous labor that came before Confederation. I am not likely to overlook the contributions made by those British stock who came here from elsewhere in North America or who were settlers from the old world in the new. Even more extended in time, and as deep in impact, have been the contributions made by Canadians of French descent. Ever since Champlain founded his Habitation at Québec -- and planted those rose bushes around it -- this air has been sweetened with the French tongue and French culture and sharpened with French intelligence and French resource. It is one of the marvels of history that a society planted so precariously in the wilderness should not only have survived but should have flourished so triumphantly, still loyal to its past and open to everything that is new. From all I hear, from everything I know, I am sure that the contributions of French Canada to the life of this country as a whole will prove even ampler in the future than they have been in the years gone by. "Confederation has given Canada the economic strength which has made it possible for her to help the needy countries in their economic development; it has made it possible for Canada to provide forces to help keep the peace where it has been threatened, and, above all, it has given increasing power and authority to Canada's voice in world affairs. This power and authority derives from the internal national unity and it can only be sustained and flourish if that national unity prospers. 1968: Under the banner, "Festival Canada", this new format showcases multicultural and professional concerts held on the front lawn of Parliament Hill that would include a nationally televised show. For the month of July, the National Capital Region throws the spotlight on cultural, artistic and sport activities. Involvement included the various municipalities and voluntary organizations. "Festival Canada" was cancelled in 1976 but reactivated in 1977. 1980: Yet another new format by the National Committee, this one stressing more local celebrations across Canada with cash being injected to promote popular and amateur activities organized by volunteer groups. This approach was adopted again in 1981 but this time 15 major cities across Canada would include a "fireworks" display. October 27, 1982: "Dominion Day" (July 1) became "Canada Day." 1985: Throughout the nation, Canada Day Committees help plan, organize and coordinate celebrations for July 1. 1990: Queen Elizabeth II celebrates Canada Day. Photo credit © Ray Duguay / National Archives of Canada and is part of the Department of Industry collection. 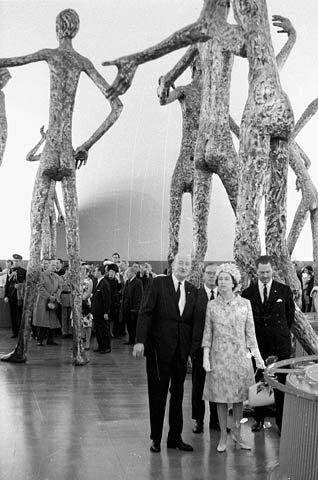 Queen Elizabeth II strolls by the aluminum figures by Mario Armengol that dominated the fifth and last chamber of the British Pavilion, July 3, 1967. 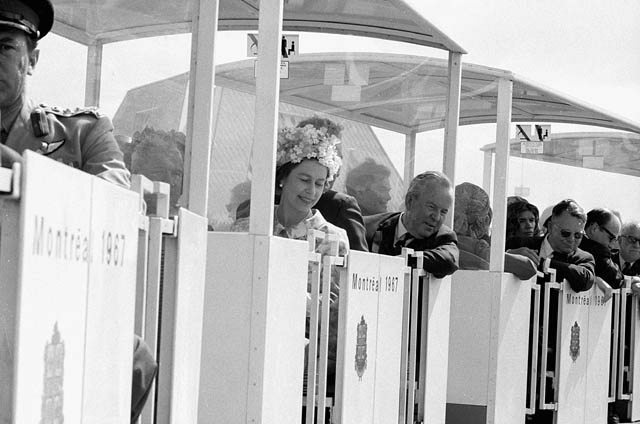 Queen Elizabeth II and Prime Minister Lester B. Pearson ride the mini-rail, July 3, 1967. It was a day to remember! Forty years ago tomorrow, July 1, 1967, Canada celebrated its 100th birthday. In countless communities from coast to coast to coast, the historic moment was observed in a great variety of ways such as parades, parties, barbecues, street dances and fireworks, along with many events of a purely local flavour. Although Saturday, July 1 was, of course, the actual birthdate, the entire year was filled with exciting happenings. Chief among these was Expo '67, a grand and glorious world exhibition held in Montreal April 28 to October 27. There were more than 50 million paid admissions to Expo '67, which used as its theme Man and His World. Another yearlong event was the Confederation Train, which stopped in 68 cities as it travelled across the country from January to December. Made up of six specially designed railway cars, it provided visitors with what was described as "a moving panorama of Canada from prehistoric times through Confederation to the present. " Niagara Falls was on the train's itinerary - it spent July 26 to 28 here. If your memory can stretch back 40 years, you may also recall a song just about everybody in the country, especially children, was humming or singing in 1967. 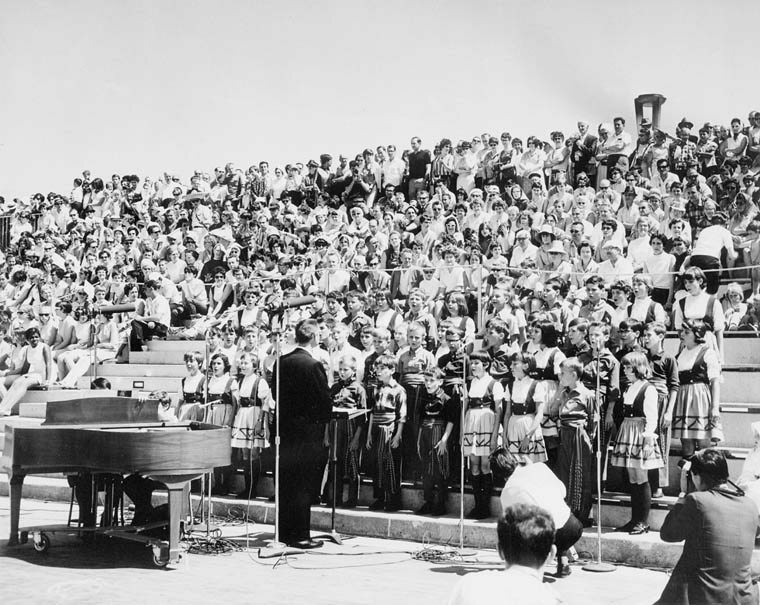 Called "Ca-Na-Da," it was written by Bobby Gimby and became the unofficial theme song of the centennial. In Niagara Falls, a noisy welcome to Canada's 100th birthday began at midnight June 30, as church bells and the Rainbow Bridge Carillon bells rang out across the city. Moments later, a chorus of car horns could be heard on most major streets. As The Review reported: "Impromptu cavalcades of cars quickly formed, filled with youths, some waving flags, others just cheering as they cruised the streets down from Lundy's Lane, along Victoria Ave. and Queen Street for a U-turn around the block containing City Hall and Centennial Square. "There was a great hubbub of 'Happy Birthday Canada' and 'Hello Centennial,' mixed with singing, whistling and shouting. "Firecrackers popped here and there in the city. Roman candles and skyrockets were more rare." At 2 p.m. Canada Day (or Dominion Day as it was then called), four RCAF and four USAF jet aircraft raced across a clear, sunny sky for a ceremonial fly-past over the falls. Then came the monster centennial parade. An estimated 10,000 cheering and waving residents lined the 4.02-kilometre route from Main Street down Ferry Street and Victoria Avenue to Queen, ending at Centennial Square. The Review provided some details about the event: "The huge parade had 1,000 participants, who made up 30 colourful floats, 14 rousing bands, 11 smooth marching units, four high-stepping majorette groups, fire engines with sirens screaming, customized and antique cars, a bevy of convertibles and 30 youngsters with gaily decorated bicycles." Following the 90-minute parade came the official opening of Centennial Square beside City Hall. The $150,000 square, which remains one of Niagara Falls' principal focal points, was the city's main centennial legacy project. Ribbon-cutting duties were performed by Mayor Franklin J. Miller. The Ladies Centennial Choir directed by Judith Davison (now MacCarthy) then sang "The Maple Leaf Forever" and the "Centennial Hymn," composed by Niagara Falls' own Rev. Kenneth Moyer minister of Lundy's Lane United Church. That's the way it was as Niagara Falls celebrated Canada's Centennial in 1967. Now, we are on the eve of the nation's 140th birthday. Happy Canada Day - See you tomorrow at Optimist Park. Sherman Zavitz is the official historian for the City of Niagara Falls and is the Niagara Parks historian. Reach him by e-mail at sherman.zavitz@sympatico.ca. Copyright © by Sherman Zavitz and the Niagara Falls Review. Used with permission with our sincere thanks. "Open pavilions like Canada's and West Germany's, as well as Habitat also attracted millions but kept no official count," wrote Time Magazine. "Only limited capacity held Labyrinth's attendance down to 1,200,000." "World Festival troupes played to an audience of 2,136,400. In all, fairgoers watched 1,035 different individual entertainers and groups put on a grand total of 17,823,000 performances." Canadian Pacific Pavilion's "We Are Young" drew 2,500,000 viewers. Czechoslovakia Pavilion's "Kino-automat" drew 67,000 viewers. Man and His Health Pavilion's "Meditheatre" drew 20,000 viewers. Forty years ago, Canada was preparing to celebrate its 100th birthday. While Canada Day is celebrated with plenty of enthusiasm in Langley and all across the country, it’s not a really big deal. Planning for the centennial year had been going on for years. There were numerous highlights, with the biggest one being Expo 67 in Montreal, which was a tremendous success in showcasing Canada to the world. Many people from this far-off part of Canada travelled to Montreal for Expo, and came back thoroughly proud to be Canadians. There were regular and comfortable surpluses. The Canada Pension Plan was established. A new flag had been chosen. The federal and provincial governments were putting the final touches on a national medicare system. There were stirrings of discontent in Quebec, but Pearson had managed those fairly well by establishing a Royal Commission on Bilingualism and Biculturalism, and by appointing well-known Quebeckers such a Pierre Trudeau to his cabinet. In short, most Canadians were very happy to be living in what they rightly considered one of the best countries in the world. There was very little discontent. Even young people, who were beginning to react strongly to “the establishment,” were pretty content in 1967, despite the fact that the government was mainly made up of people in their 60s. Pierre Berton wrote a book about 1967 calling it “The Last Good Year.” While that may be stretching it a bit, it was a memorable year and a great time to be a Canadian. The Czechs are exposition-prone: they enjoy exhibitions, at home and abroad, and they do them well. At Brussels in 1958 they won the gold medal for the best pavilion. At Expo they made perhaps the most ambitious single national contribution to the fair. They brought not only a pavilion, with its expensive and sumptuous restaurants and its incomparable films and displays, but also the elegant Koliba restaurant, down at La Ronde, in which every glass, every ashtray, was stylish; and they brought Laterna Magika, the film-with-live-actors show. The deputy commissioner-general of their pavilion explained why: "We are a very small country but we are a proud people. We think we have done something in this region of Europe where we have lived these last twelve hundred years. We have created a sort of civilization -- and we want to show it, particularly to the American continent, which has not a clear idea, an image, of Czechoslovakia." But the image-building was never obvious: the Czechs made their point with subtlety. In this case, as Marshall McLuhan puts it, the medium was the message. The medium was the pavilion itself, and the message was that a country which could produce a walk-through art object as delightful as this one, must be, in some significant way, admirable. Even some of those visitors who hate and fear the very idea of Communism found themselves -- perhaps against their will -- thinking about Czechoslovakia in a fresh, surprised way. It may eventually be agreed that that was the greatest of all the Czechs' triumphs. © Copyright 1968 by Robert Fulford and McClelland and Stewart Ltd., all rights reserved. 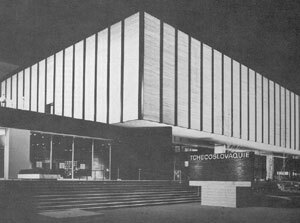 WHAT EVER HAPPENED TO THE "CZECHOSLOVAKIA PAVILION?" YOU'LL NOW FIND IT LOCATED IN NEWFOUNDLAND! As of July 12, 2005, it became the Gordon Pinsent Centre for the Arts, in honour one of Grand Falls native sons - actor and writer Gordon Pinsent, on his 75th birthday, and during the town's Centenary. The story of how this building came to be built is a very interesting one: on Tuesday, Sept.5, 1967 at Gander International Airport, a Czechoslovakian Airliner crashed on take off. Of the 69 people on board, 32 died instantly and five died later in hospital. Without the rescue efforts and dedication of the people from the James Paton Memorial Hospital in Gander, the Central Newfoundland Hospital in Grand Falls, and local rescue workers, more lives would have been lost. In 1968, as a gesture of gratitude, the Czechoslovakian Government transported to this site the major complex from its pavilion at Expo '67 in Montreal. It was reconstructed by the Newfoundland government and kept the exact same design and layout as the original structure. It took several years to complete the reconstruction due to financial problems, but finally the Centre was officially opened in July of 1971. In the Centre there is an art gallery, a four hundred seat theatre, and a public library. The theatre is named the Neala Griffin Theatre, after the prominent theatre and performing arts enthusiast who lived in Grand Falls. She was president and director of the Northcliffe Drama Club and she was also involved with adult education in the region. The Art Gallery is named for Gwendolyn Cooper. She was the wife of the mill manager in the early days of the town and also a prominent arts supporter. Mrs. Cooper arranged many arts exhibits, and taught artC encouraging many young artists to pursue their dream. She also started and encouraged the first performing arts group in this region. The Harmsworth Public Library, named in honor of the Harmsworth family which founded the Anglo-Newfoundland Co. Ltd., moved from its original location on Church Road to this building on November 30, 1971. This wonderful building continues to attract many cultural events. Performers and visual artists from all over the world have performed or exhibited in this Arts Centre. Throughout the year visitors and patrons alike are invited to view local, provincial, and national artworks and performers as well as use the public library as a resource centre. Housed in the Art Gallery is a permanent collection called "Project 2000", sponsored by the Central Newfoundland Visual Arts Society, which is a fine example of prominent Newfoundland born artists. The temporary gallery features works by local and regional artists. © Copyright by Grand Falls-Windsor Arts and Culture Centre, all rights reserved. Click here for photo gallery of the Grand Falls-Windsor Arts and Culture Centre which includes: Balcony seating; seating and stage; Harmsworth Library; Main Lobby: Theatre Doors; Main Lobby and Staircase; and a few theatric scenes. Deirdre McIlwraith was 24, a graduate of Queen's University in Kingston, Ont., and fluent in French and Spanish when she landed a job as a protocol officer with the Canadian Corporation for the 1967 World Exhibition, the organization that planned, built and ran Expo 67 in Montreal. McIlwraith worked at the Restaurant Hélène de Champlain, the venue used to host lunches for visiting dignitaries and heads of state. She officiated at events for Princess Grace of Monaco and Princess Margaret, the sister of Queen Elizabeth II. She remembers the representatives of the Ivory Coast in equatorial Africa, who were uniformly tall, spoke impeccable Parisian French and were elegantly dressed in the latest fashions from France. She vividly recalls a tiny, frail and elderly Haile Selassie, Emperor of Ethiopia, who arrived with his dog and insisted that it sit under the table next to him and be served ground filet mignon. She recounts a tense lunch in late July when Montreal Mayor Jean Drapeau rebuked French President Charles de Gaulle after his infamous "Vive le Québec libre" speech delivered from a balcony at city hall. McIlwraith was on duty for dozens of such lunches, but what she remembers most vividly was the exuberance and almost breathless excitement of the ordinary people who flocked to Expo 67 from every corner of Canada and around the world from the moment the gates opened to the public on Friday, April 28, 1967. "Right away, the fair was a hit," she says. "It was fantastic. It was wonderful to feel that Canada was meeting its potential. You really felt anything was possible--that we could have a bicultural, bilingual Canada, that we could have the best of Europe and the best of North America." Expo 67 was a celebration of Canada's first 100 years and it occurred at a time when Canadians were in a celebratory mood. After the Great Depression and World War II, the 1950s and 1960s brought unprecedented prosperity and optimism. It was a time of striking medical advances, big families, increasing urbanization and the creation of generous social programs. Immigration was also enriching Canadian society. Newcomers from southern and eastern Europe, from Asia, Africa and the Caribbean, were making the country more diverse, more tolerant and more exciting. There were very disturbing developments internationally such as the Cold War and the conflict in Vietnam, but they were considered by many to be largely other people's problems and nothing to put a damper on Canada's centennial or its world fair. The fair opened "officially" on April 27 while hundreds of workmen scrambled to put finishing touches on pavilions, restaurants and other facilities. 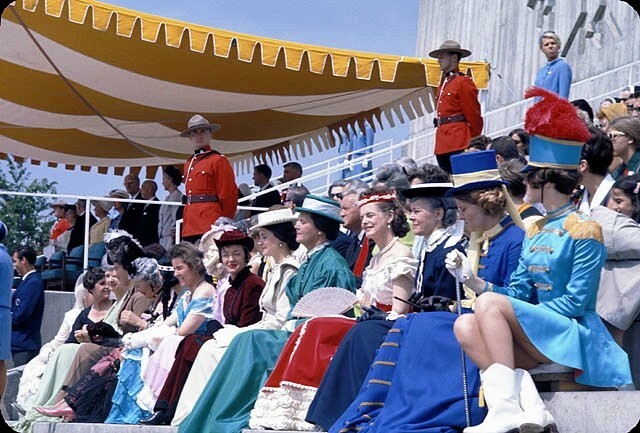 Governor General Roland Michener, Prime Minister Lester B. Pearson, Mayor Drapeau, all 10 provincial premiers and 53 heads of state toured the fair and then some 7,000 invited guests got their first peek. Expo was built at a cost of $415 million on two islands in the St. Lawrence: Île Ste-Hélène, a natural formation that was enlarged by millions of tonnes of fill; and the totally man-made Île Notre-Dame. The site spanned nearly 1,000 acres, which was room enough for 39 restaurants, 62 snack bars, an amusement park called La Ronde, parking for thousands of vehicles and the pavilions of 62 participating countries as well as hundreds of corporations. Many of the official guests were star struck by what they saw, especially the space-age geodesic dome that housed the American pavilion, the 10-storey, futuristic housing development called Habitat '67 that consisted of randomly stacked dwelling units, and an internal transportation system of hovercrafts, Venetian-style gondolas and two elevated railways. Quebec Premier Daniel Johnson described Expo as "more wonderful, more beautiful that anyone had ever predicted," and the prime minister told a journalist: "Anyone who says we aren't a spectacular people only has to see this." After the politicians, the dignitaries and the VIPs left, ordinary Montrealers and others from further away began lining up for the public opening at 9:30 the following morning. The first person through the gates was Al Carter, a 39-year-old jazz drummer from Chicago who had paid $12 for a seven-day Expo passport bearing the number 00001. By the end of that day, some 335,000 people had visited the fair, twice as many people as expected. On Sunday, April 30, attendance hit an astonishing 530,000, which would prove to be Expo's biggest one-day crowd and which pushed the total for the first three days over the one million mark. Then the reviews began to appear and they were almost universally laudatory. Time magazine devoted seven pages to Expo in its May 5 issue and was giddy in its descriptions. The crowds, Time reported, were "stirred, made happy, thrilled and dazzled by a world spectacularly bigger than themselves." The magazine went on to describe Expo as "a Centennial adventure in which a Canada newly brimming with self-confidence is playing host to the world and perhaps finding itself into the bargain." Not to be outdone, the New York Times newspaper declared that: "The sophisticated standard of excellence...almost defies description." The Economist magazine stated that: "The acclaim won for the man-made islands in the St. Lawrence may have done more for Canadians' self-confidence than any other recent event." Among domestic commentators, few could surpass Peter C. Newman's observation that: "This is the greatest thing we have ever done as a nation (including the building of the CPR)...if this sub-Arctic, self-obsessed country of 20 million people can put on this kind of show, then it can do almost anything." By the time the fair closed its gates for good on Sunday, Oct. 27, Expo 67 had achieved renown as one of the most successful world exhibitions since the first of its kind was held in London, England, in 1851. The only serious rivals were the Paris world fair of 1900, which enjoyed the participation of 58 countries and drew 50.8 million visitors, and the 1958 Brussels exhibition, which drew some 41.4 million people. 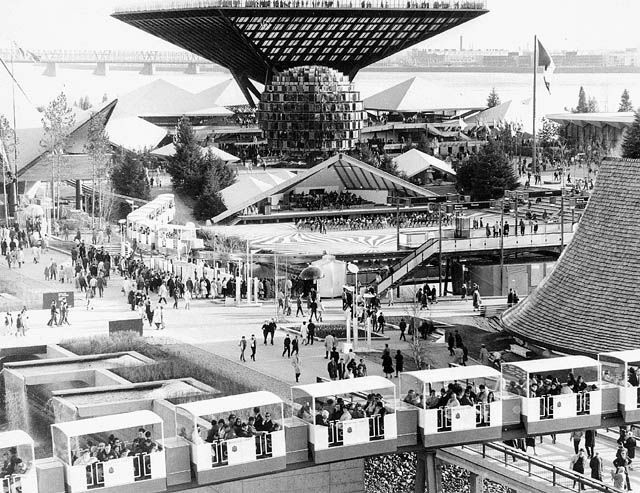 Expo 67 attracted 50,306,648, more than 2½ times the entire population of Canada at the time. For Montrealers, the end of the fair was an emotional event. "The mood that prevailed during Expo's 185th and last day was a curious bittersweet mixture of joy and pride and sadness," wrote the Montreal Gazette newspaper's Nick Auf der Maur. Staff at various pavilions handed out horns and flags bearing the Expo logo and the words "Au Revoir Expo," but as Auf der Maur noted: "These failed to achieve a holiday atmosphere. Despite the large crowds everywhere, the day was more of a fond, personal farewell in a summer of romance." That Expo 67 had made such an impact was all the more remarkable given its origins. In the late 1950s, Conservative Senator Mark Drouin began pushing the idea of hosting a world's fair to celebrate Canada's centennial. But in 1960 the Paris-based Bureau of International Exhibitions (BIE) awarded the 1967 universal exposition to Moscow since that year the Soviet Union would be celebrating the 50th anniversary of the Russian Revolution. The Soviets worked on the project for two years and then scrapped it as too costly. Mayor Drapeau and a small group of talented, ambitious Montrealers saw their opportunity. They would convince the BIE to award the fair to their city, and they did. The bureau made its decision on Nov. 13, 1962. That left Montreal with just 4½ years to get ready for an event that would normally take seven. The biggest miracle about Expo 67 may be that it was finished and opened on time, and those who built it have treasured the memory ever since. "My wife thought I was crazy to accept a position," recalls director of operations Philippe de Gaspé Beaubien, who went on to found the Quebec-based broadcasting company Télémedia Inc. "We had to work night and day. I lived in a room on top of the Hélène de Champlain and my children used to come and see me there on the weekends. Fortunately, I have a very strong and supportive wife." "The part that was really exciting for me was to see the emergence of the pavilions," says Montreal stockbroker Daniele Touchette, who was a hostess and led visiting foreign delegations on tours of the construction site. "At first, there was nothing there. You'd see scale models and then you'd see one pavilion coming up and then two and three. It was so exciting." Diana Nicholson was a 22-year-old, bilingual American when she became one of the first 100 employees of the Expo corporation. She was hired as a liaison person in the public relations department and was supposed to handle communications with French West Africa and Latin America. That quickly changed. "I spent about a year travelling across Canada to every kind of exhibition or show conducting public briefings on the project," she says. "I remember travelling with this enormous scale model, which turned out to be totally inaccurate because we didn't really have any idea of what we were going to be putting in various places." One of the first challenges was to develop a theme for the fair, a task assigned to a select group of intellectuals, artists, scientists and administrators, including the novelists Hugh MacLennan and Gabrielle Roy. They met for three days in May 1963 at Montebello, Que., and came up with Man and His World, which was inspired by the Antoine de Saint-Exupéry story Terre des Hommes and the line "To be a man is to feel that by carrying one stone you contribute to the building of the world." The Expo corporation and the City of Montreal spent about nine months trying to settle on a site. Developers, landowners and speculators lobbied for a dozen or more properties in and around Montreal, but the mayor had his own unique plan. The fair would be built on two islands in the St. Lawrence River, one substantially enlarged, the other built from scratch with 25 million tons of fill from the new 34-kilometre long subway system. Many thought the idea ridiculous, including the prime minister. In a letter to Drapeau, Pearson dismissed the plan as "one of the silliest things I have ever heard," and added: "With four million square miles of land we should be able to find a plot some place." But there was no swaying the mayor. On Aug. 12, 1963, Pearson himself pulled a lever and a front-end loader dumped the first 25 yards of earth onto Île Ste-Hélène. For the next seven months, a truckload of fill was deposited every four minutes, around the clock and by June 26, 1964, the city turned over the islands to the Expo organization. The man who built the fair was Colonel Edward Churchill, a retired army officer recruited from a cushy government job in Ottawa. He had 878 days to get the job done and it nearly killed him. After months of long days that frequently ended at midnight, he collapsed from exhaustion during a conference and required a stay in hospital. Churchill adopted the United States space program's critical path technique for co-ordinating and advancing multiple tasks simultaneously. Every single project on the islands was broken into stages from planning right through to completion to ensure that there were schedules and that people stuck to them. Another big challenge was to convince the world to participate, and that task fell to Expo's commissioner Pierre Dupuy, a career diplomat recruited from the Department of External Affairs. He visited 125 countries, met 90 heads of state, travelled more than 250,000 miles, enlisted every Canadian diplomat abroad to work on the nationals in their countries and succeeded wildly. Nicknamed Mr. Energy by his staff, Dupuy convinced 62 nations to participate, a new record for a world fair, and they came from every corner of the world, including Great Britain, France, Germany, Venezuela, Jamaica, Barbados, Cameroon, Ghana and Tanzania, Korea, Burma (now Myanmar), Iran and Kuwait. Of all the pavilions and exhibits, two became landmarks that captured the futuristic spirit of the entire enterprise. 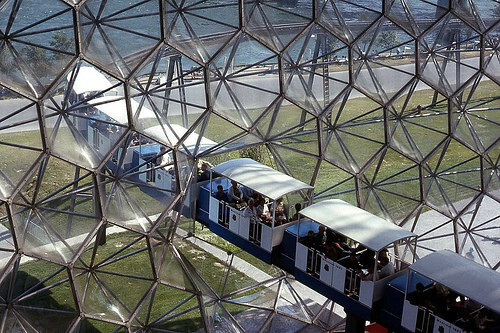 The first was America's geodesic dome, which was designed by the architect, inventor and visionary Buckminster Fuller and known as Bucky's Bubble. While some fairgoers found the exhibits pedestrian, the structure itself was striking--a sphere 250 feet in diameter and 200-feet high with a cathedral-like grandeur inside. The exterior was made of acrylic panels attached to a honeycomb-like frame of steel tubes, and it was transparent. That gave the dome "a light, fairy-tale feel," according to author Pierre Berton, who added: "At night, lit from within, the dome was sheer fantasy." The other structure that became an enduring symbol of the fair was Moshe Safdie's Habitat '67. Safdie was a 28-year-old architect who was born in Israel, but grew up in Montreal and developed the concept in his master's thesis at McGill University. It consisted of 354 pre-fabricated, concrete boxes, which were hoisted into place with cranes and placed helter-skelter to form 158 apartments. "Just about every rule, precedent, practice, custom and convention is broken by Habitat," Ada Louise Huxtable of the New York Times wrote. But she went on to describe it as "a significant and stunning exercise in experimental housing." Habitat '67 remains in use to this day as a housing development, though most of the units are privately owned. In 1976, a fire destroyed the acrylic exterior of Fuller's dome, but it was replaced and the structure now houses a museum called the Biosphere. The amusement park continues to operate as La Ronde, but there are few other physical reminders of Expo 67. The passage of time has also erased much of the goodwill and idealism that made Expo possible. The kidnapping crisis of October 1970, the election of separatist governments in Quebec, the exodus of English Montrealers and the economic decline of Montreal all served to erode the optimism and camaraderie that allowed Canadians to dazzle the world. "It was a very interesting time," says Beaubien, now in his 80th year. "Our minds expanded." And so did our sense of what it meant to be Canadian and what we could achieve when we worked together. Copyright © by D'Arcy Jenish and the Canadian Legion Magazine, May, 2007 edition. Used with permission with our sincere thanks! THE FIRST thing sensible Expo visitors should do is catch the blue mini-train. At 50 cents, the hour-long trip is the best ride at the fair. Not only is it half as cheap and twice as exciting as Sean Kenny's overpublicized Gyrotron, it's also the only way visitors can soar above the crowds, orient themselves and admire the incredible architecture from all angles. Actually, there are three mini-rails. But the other two, carrying yellow trains and costing only 25 cents, are minor mini-rails and less spectacular. One merely trundles past the few pavilions the blue train misses; the other plows a fairly obvious path around the rooftops of the La Ronde amusement area. The mini-trains operate on the monorail principle, are fully automatic and pay scant attention to the conventional railway problems of gradients and curves. One moment the train is rolling along the water's edge; the next it is looping high over the river and curving back at the fourth-floor level of the French Pavilion. The blue or major mini-train covers most of the worthwhile sights from one vantage point or another. It plunges right through the heart of the giant U.S. geodesic dome, circumnavigates the Soviet Pavilion, ducks under the plastic of the Ontario Pavilion and connects with both the Expo-Express train service and the Montreal Métro subway station at Expo. In between, little is missed and camera buffs will find themselves clicking shutters every time they turn around. The mini-rails have a couple of mini-disadvantages. One is that a breakdown of a single train brings the whole closed system grinding to a halt. It can be a chilly business getting stuck in the open-air cars -- especially at night. It can also be tedious. One Expo guide tells of the nightmare experience of being stalled with a foreign VIP for 90 minutes in front of a pavilion he didn't know much about. The other drawback is that the mini-trains are more sight-seeing excursions than transportation systems. To get to point A from point B it's usually quicker to walk. The 3½ -mile Expo-Express train, which is fast and free, links the four main Expo sites. But once away from this main line the visitor has to depend mainly on his feet. There are of course a bewildering variety of other modes of transportation. Steamboats, gondolas, canoes and even Hovercraft cruise the many lakes and canals. Conventional tractor trailer trains service some areas. And the really affluent visitor can hire a boy-powered Pedicar for 10 cents a minute -- a modernized version of the rickshaw. But none of these trips give half as much value for the money as the blue mini-rail. © by Maclean's magazine, 1967 June edition. All rights reserved. Photo credit: © the Funkafonik collection at Flickr.com, taken in 2004 using a Canon PowerShot A40. 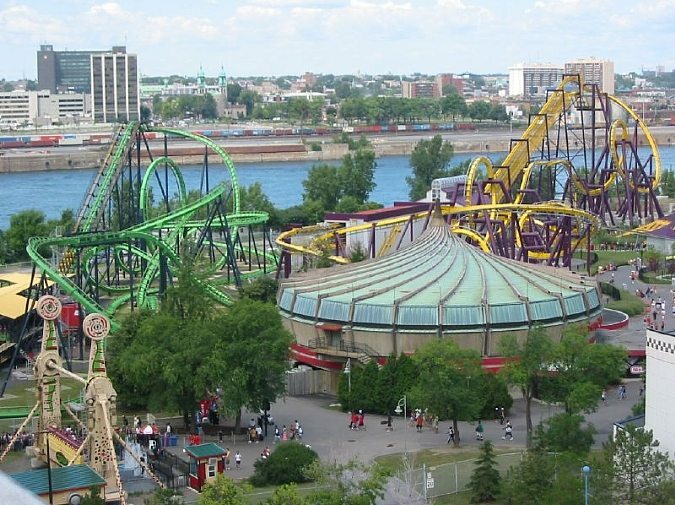 MONTREAL, June 14 /CNW Telbec/ - This weekend, June 16 and 17, La Ronde will be celebrating EXPO 67's 40th anniversary, with a host of activities taking place during this special retro event. Visitors who present their original EXPO 67 passport will be admitted free to the La Ronde grounds. As people enter the park, they will be welcomed by delightful EXPO hostesses and charmed by go-go dancers performing on podiums along the main walkway. Saturday's attractions will include "go-go stilt walkers", an exhibition of cars dating from 1967 and 67 cents hot dogs. At Le Jardin des Etoiles at 7 p.m., audience members will experience 40 years of emotions during Jean-Guy Moreau's "40 ans, 40 voix" show. In addition, guided tours on Saturday at noon, 2 p.m., 4 p.m. and 8 p.m. and Sunday at noon, 3 p.m. and 6 p.m. will enable visitors to rediscover the site. About Six Flags: The world's largest regional amusement park firm and owner of La Ronde, Six Flags Inc. is a publicly traded company (NYSE: SIX) based in New York. On this date, the Ottawa Citizen publishes the following article: "The Greatest Show on Earth" written by Gord Atkinson who passionately writes about his fond memories of Canada's Centennial and Expo 67. And in yesterday's edition of the Ottawa Citizen, they published "Happy Centennial plus 40" written by Eric Watson who has been one of the many contributors to this Expo 67 website. The Toronto Star lists the "7 wonders of Canada"
"It's not the land that has made our country what it is...it's the way we've shaped it and the things we've built on it, the monumental achievements of engineering and imagination in which we took a wilderness and forged it into a nation." -- Christopher Hume, Architecture Critic, Toronto Star. A descriptive detail on why these structures were chosen are included in the report by Christopher Hume, plus 7 other alternative choices deemed to be of historical importance to Canada. To read Hume's excellent report filed on this date from the Toronto Star, please click: "7 wonders of Canada"
What did you do in 1967? Take a special trip? Volunteer on a Centennial project? Visit Expo in Montreal? Click here to share your unique memories and photos. Read other submissions here and see the Citizen on July 1 to read the best. Letters must include the writer's full name, address and daytime phone number. Main index to the above links, click here. 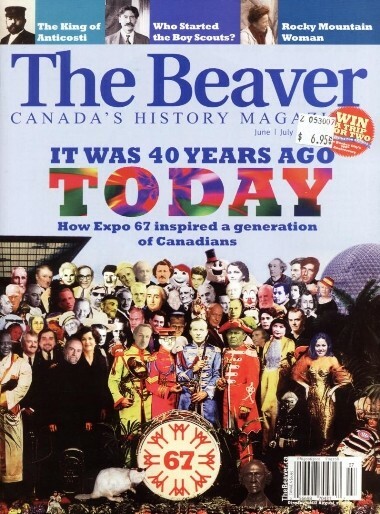 Now available at newsstands as of May 31, 2007, an excellent write-up on Expo 67 by Christopher Moore appears in The Beaver, Canada's History Magazine. Their cover for this edition, is a parody of the innovative artwork found on The Beatles iconic "Sgt. Pepper's Lonely Hearts Club Band" LP which was released, June 1, 1967 in the U.K. The significance is that this new album by the Beatles was heard for the very first time in North America at Expo 67. Gilles Gougeon, in a separate story not found in The Beaver magazine, tells how it happened to Bernard St-Laurent, host of CBC's "C'est la vie." To hear the interview, click on the link and scroll down until you see "C'est la vie, April 29, 2007" and then click: Gilles Gougeon.